As I write this you probably wonder why a Canadian Labrador has any right to comment on such matters. I have lived in London for half my life (five years, thirty-five of your human years give or take), and have shared a home with Kevin the British Bulldog. I also absolutely love sausage and mash ,although this is a rare treat as my human companions have taken to eating mashed avocados which don’t agree with me at all!. You should by now be nodding in agreement that I am well qualified to comment on Brexit. I remember the day the news broke like it was yesterday. Kevin and I were on our usual walk through Victoria Park when we bumped into Alessandro (an Italian Greyhound) who was a little more agitated than normal. After we got the formalities out of the way (bum sniffing etc) he informed me of the news. Alessandro had overheard his humans discussing the vote and their absolute horror at how the leave result might affect queues at the Eurotunnel when they took their annual trip skiing in the alps. Kevin and I have never understood skiing, going down a hill quickly with the sticks already in your possession and no incentive other than some form drink at the bottom!? Our owners had only ever taken us to the hot bit of France where it seemed the whole holiday was about sitting by swimming pools (that I apparently wasn’t allowed in) consuming drinks called beer and ‘fizz’, both of which turned our owners into complete xxxxs. Suddenly Delphine (a French Bulldog) arrives somewhat later than normal, she cannot believe the result and advises that in any messy divorce someone will end up worse off, and on this occasion it would be us dogs that would suffer the most. According to Delphine dogs could end up being treated as third class citizens, which is weird as class is something dogs really don’t understand. Kevin explained in simple terms that people would look down their noses at us (more than normal) and we would feel like outcasts. That was over two years ago now. Pre-Brexit I grew accustomed to the way humans can comfortably ignore each other on their walks and at best make polite conversation whilst we catch up with our friends (which is almost everyone!). However, post Brexit I really noticed a shift in people, I often overheard my owners moaning about those who had voted leave (apparently their parents for one) and speculating about those they weren’t sure of. A very well-educated friend of mine Bernhard (who happened to be a St Bernhard from Switzerland with rather unimaginative owners) commented regarding the so called ‘rule of the people’ and how Brexit is a prime example of when democracy fails, he also eats his own poo so who knows. Now Chloe (an American Water Spaniel) commented that the whole thing was a complete shambles and the British government was making an utter mess of it, this from someone who’s leader has become a well-known dog chew toy…. Kevin and I are somewhat immune to the situation, we can’t vote in parliament so cannot change the current outcome. We are not Brexit negotiators from within the EU so have no influence there either. This leaves us in the uncomfortable situation of having to listen to humans constantly debate what will happen next, always reaching the same conclusion- they have no idea. 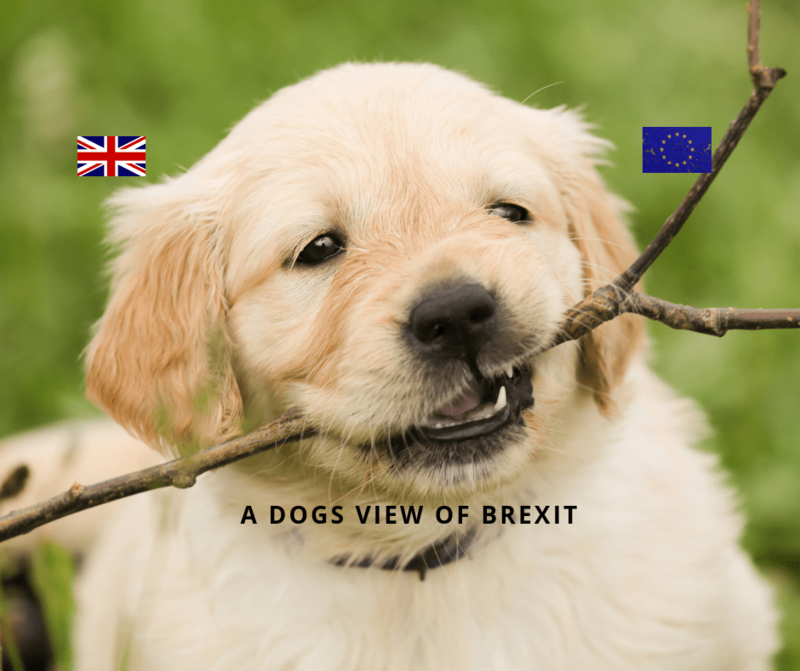 What is more surprising to us dogs it the amount of prejudice from leave and remain voters alike. Dogs really don’t understand this behaviour, someone has to treat us really badly before we develop an aversion to them, or people like them. Dogs take all-comers as they are, yes, we shout at each other a lot and fight over tennis balls, but we always leave the park as friends. And surely that is the solution, chasing a ball. Possibly Teresa May vs. Jeremy Corbyn, whoever gets the ball first chooses the outcome. That is a race I would like to see….